The Cardinal ...Camparinette...Americano...Negroni. This classic cocktail has gradually become one of my very favorite cocktails to both drink and make. I first tried this cocktail in Europe very many years ago and I think my palette was not developed enough at the time, because I did not enjoy it as much as I do now. This magenta masterpiece is very simple to make but also has a variety of flavors. Let's face it, when a drink consists the combination of distinct flavor profiles such as Gin, Campari and Sweet Vermouth, one must know that this drink has something to say. 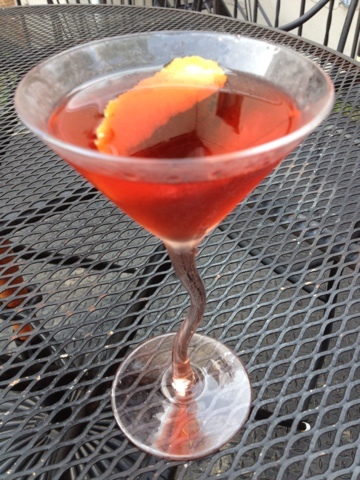 The Negroni was not considered the "Negroni" until the early 20th century in Florence, Italy. 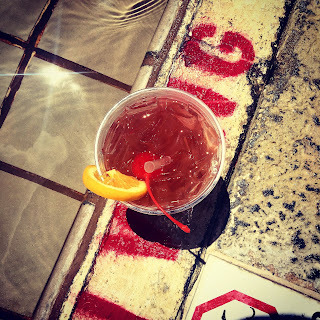 A Count by the name of Camillo Negroni once asked for a stronger version of an Americano (Campari, Sweet Vermouth and club soda) at a bar, and the bartender replaced the soda with gin. The rest is history. The Negroni fell behind the spotlight until recent years, particularly in America. Now, many trending restaurants and bars are bringing this historic drink back on the stage. There are restaurants such as Fig in Charleston, South Carolina that constructed an uber-creative Negroni cocktail menu in 2011 (www.eatfig.com). Another great component to the Negroni is that it is somewhat versatile. You can make it on the rocks or straight. You can vary on what you would like to do with the orange, whether its zest, juice, bitters or a peel. Just about any Gin will work for a Negroni and you can use either a rocks glass over ice or a coupe glass. You can also vary the pours, however I like mine equal parts Gin, Campari and Sweet Vermouth. So, what are you waiting for? Give this classic a try. It is well worth it.